I spent Easter in Cornwall, and thought I'd take the opportunity while down there to hand over three dolls I've just made to my sister's friend Vicki. She lives by the beach and turned her garage into a gorgeous gallery/shop called Seadrift a couple of years ago. She opened for the season at Easter, and we went and celebrated with her over a glass of Buck's Fizz, on a lovely sunny morning. 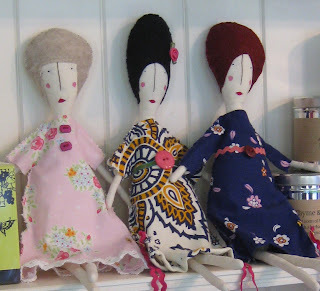 She was thrilled with the dolls, and gave them pride of place on her dresser amongst lots of treasures. I think they look just right in their new home!